The denominational churches are now teaching that the overall scriptural evidence is against the view that women should be subordinate to men in the church. Therefore, they are appointing women to publicly preach, and to be members of the governing body of their respective denominational churches. There are generally two extreme views concerning the woman’s work and place in the church. Some people would place no limitations upon the work of women in the church. On the other hand there are others who would penalize the woman, and say that she has nothing to do in the work of the church. According to the Bible, both of these positions are false. 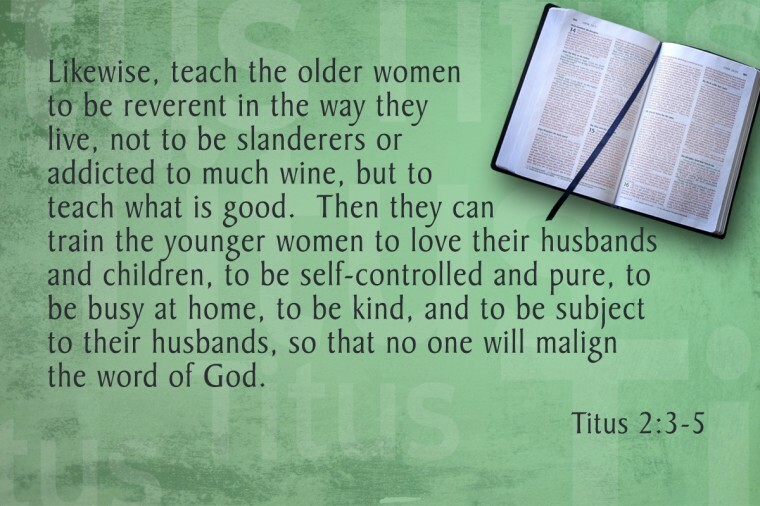 “Teachers of good things; that they may teach the young women to be sober, to love their husbands, to love their children, to be discreet, chaste, keepers at home, good, obedient to their own husbands, that the word of God be not blasphemed (Titus 2:3-5). “Let a woman learn in silence with all submission. 12 And I do not permit a woman to teach or to have authority over a man, but to be in silence” (1 Timothy 2:11-12 NKJV). The prepositional phrase “over the man” modifies the two infinitives “to teach” and “to usurp authority.” Therefore, a woman may not teach “over the man,” neither may she usurp authority “over the man.” This passage does not condemn a woman in teaching or holding authority: but, if a woman is forward, and takes dominion over the man either in teaching, or in holding authority, she is in violation of the clear teaching of this passage. This scripture would forbid a woman preaching in public assemblies where she would be teaching over the man, and it would also forbid a woman being in the governing body of the church where she would be holding authority over the man. Therefore, these denominational churches are clearly wrong in their contention that the Scriptures do not give any evidence for the woman being in subjection to the man. The woman is equal to the man in many respects, but she is not equal to the man in authority. Paul said, “But I would have you know, that the head of every man is Christ; and the head of the woman is the man; and the head of Christ is God” (1 Corinthians 11:3). The authority which Christ exercises over the church is compared to the authority of the man over the woman (Ephesians 5:22-24). Because of the creation, and the role of the woman in the fall of man, she is to be subordinate to the man. Any disposition on her part to be forward in the affairs of the church is not in keeping with the attitude of a faithful Christian woman (1 Peter 3:1-7). In some places today, men in the church are teaching that women may preach, and lead prayer in public worship services of the church. They contend that the woman is not out of place as long as she is authorized to do this by the man. But no one has the authority to authorize anyone to do anything that is forbidden by the word of God, and since the Scriptures prohibit the woman to teach or usurp authority over the man, such practices are wrong. Concerning women speaking in the church, Paul wrote to the church at Corinth saying, “Let your women keep silence in the churches: for it is not permitted unto them to speak; but they are commanded to be under obedience, as also says the law. And if they will learn anything, let them ask their husbands at home: for it is a shame for a woman to speak in the church” (1 Corinthians 14:34-35). There was confusion in the church at Corinth because some persons were speaking at the same time. Paul admonished the prophets to speak, two or three, each one in turn; whereas, they had been speaking at the same time and causing confusion. It seems that the wives of these prophets were adding to the confusion by asking questions and generally disturbing the peace and order of the assembly. There are times when a woman might even help teach a man, such as Priscilla did in helping her husband Aquila teach Apollos the way of God more perfectly (Acts 18:26). This she did in the context of being in subjection and association of her husband. This is the exception, not the rule!